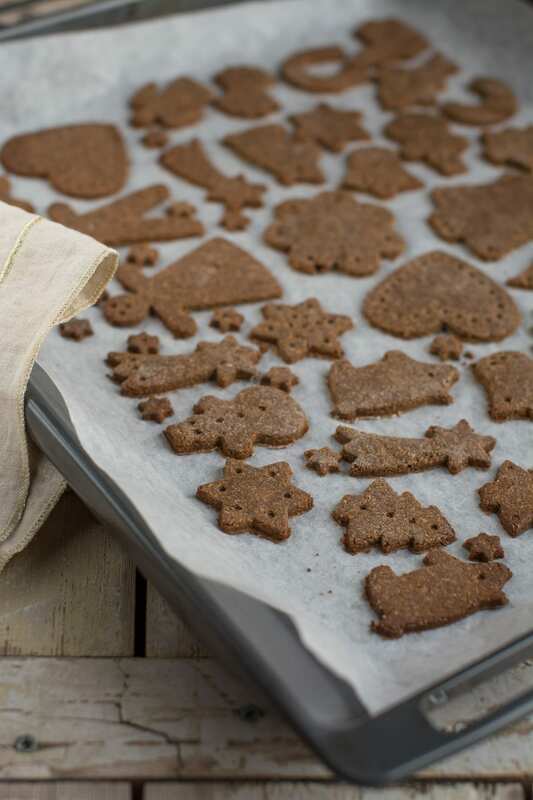 There’s a special relationship between gingerbread and me – since I changed my way of eating and started this blog I’ve developed a new gluten-free vegan gingerbread recipe each year to cater my evolving needs and understanding of a healthy treat. My very first vegan gingerbread recipe, which is actually not on the blog, as I didn’t have a blog at the time, used coconut oil and agave syrup. After that came Gingerbread Cookies, Sugar-Free & Plant-Based where I substituted syrup with dates, but the recipe still included coconut oil. 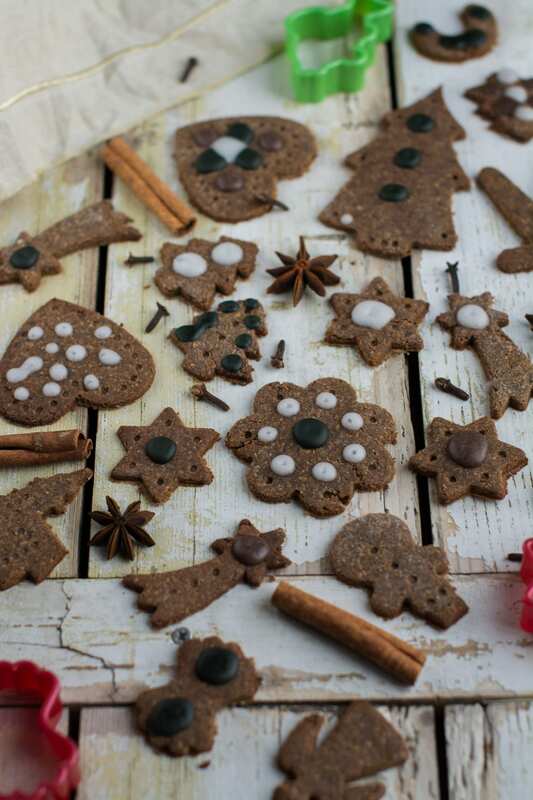 Last year I developed Whole Food Plant-Based Gingerbread containing no oil or syrup, just whole food ingredients – gluten-free grains, dates, nuts, spices and plant-based milk. This year I kicked myself out of comfort zone once again by starting vegan Candida diet in August. Nothing has more strength than dire necessity and so new gluten-free vegan gingerbread recipe was born. I’m really thankful to my dietary restrictions as they make me more creative. I don’t think I would have developed new gingerbread recipes if I didn’t need to. I would have just repeated last year’s, because after all they were delicious and still my hubby’s favourite recipe. However, now I can make a whole bunch of vegan Candida dieters happy, hopefully. This year, in addition to this vegan gingerbread recipe I also made quite unconventional gingerbread cookies with butternut squash, which are also Candida diet friendly and of course delicious as hell. In this new vegan gingerbread recipe I substituted quite a few ingredients. I could have stuck to buckwheat and millet like last year, but I wanted to bring the glycemic load of my gingerbread down (both buckwheat and millet have quite high load), which is why I used my recent favourite oat bran. However, as it’s rather coarse I ground it up in a grinder to make the batter finer. I didn’t do that with the first batch and the batter became just too mealy. I also decided to use store-bought raw buckwheat flour as opposed to grinding it myself from groats, as I couldn’t get the groats into fine enough flour in my grinder. Instead of peanut butter I went for tahini and sunflower seed paste. You could use almond butter as well (if you don’t mind spending a small fortune), which is also Candida diet friendly or any other nut butter if you have no dietary restrictions. To add some sweetness to my vegan gingerbread recipe I really didn’t have other options but to add xylitol and stevia. 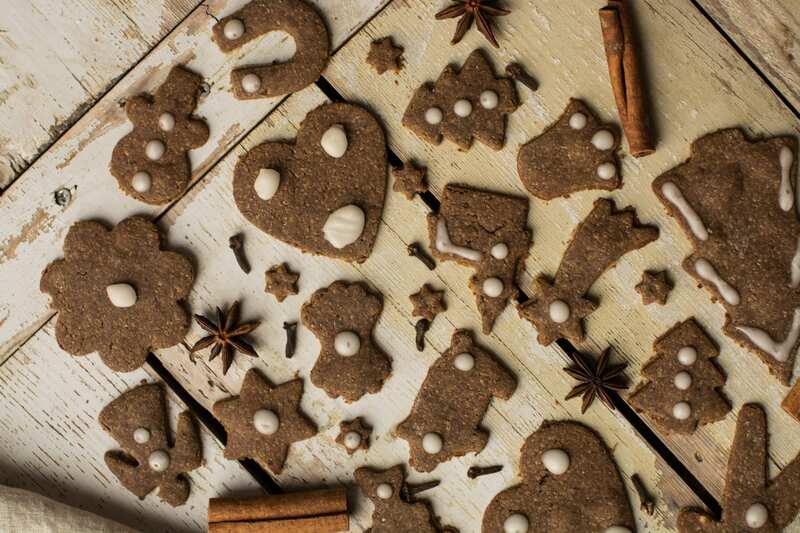 Some sweet taste also comes from almonds, carob, rice or oat milk and applesauce, but it’s just not enough for this gingerbread. 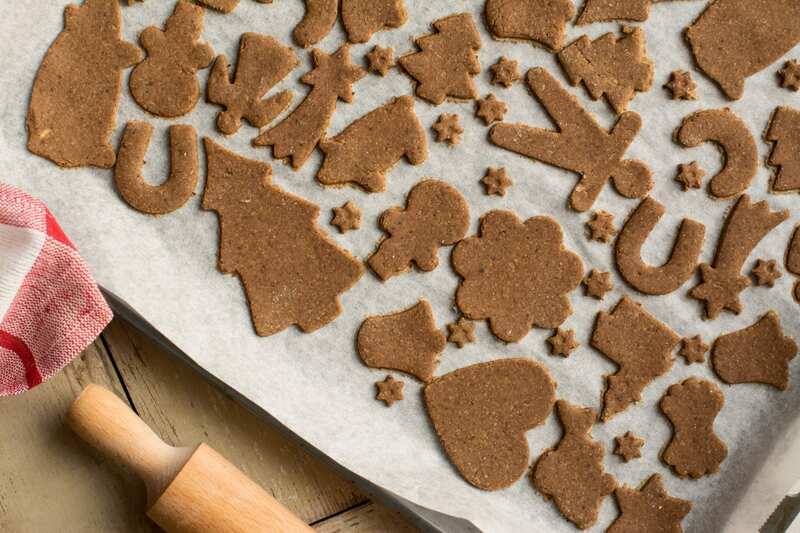 If you plan to decorate your gingerbread cookies generously, you might add a little bit less of sweeteners, as the icing is extremely sweet. 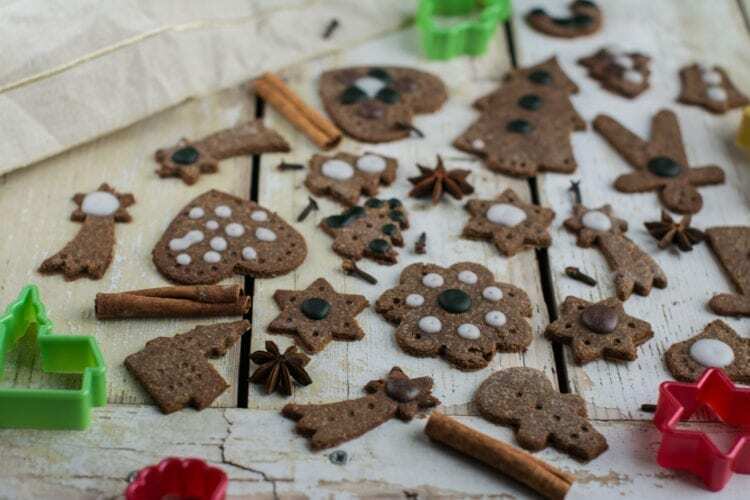 Besides being Candida diet friendly, this vegan gingerbread recipe came out oil-free, refined sugar free and gluten-free (if you are sensitive to avenin in oats, substitute oat bran with rice bran or with buckwheat or millet flour). Grind almonds into fine meal. Grind oat bran until it has a finer texture. In a small bowl, whisk together all the ingredients of wet mixture. Pour the wet mixture on dry ingredients and mix well until a well-incorporated batter forms. I find it the easiest to use my hand. Put the dough ball (which is supposed to be quite soft) into a sealed container and refrigerate overnight or all day or at least for 6 hours. It’ll firm up. 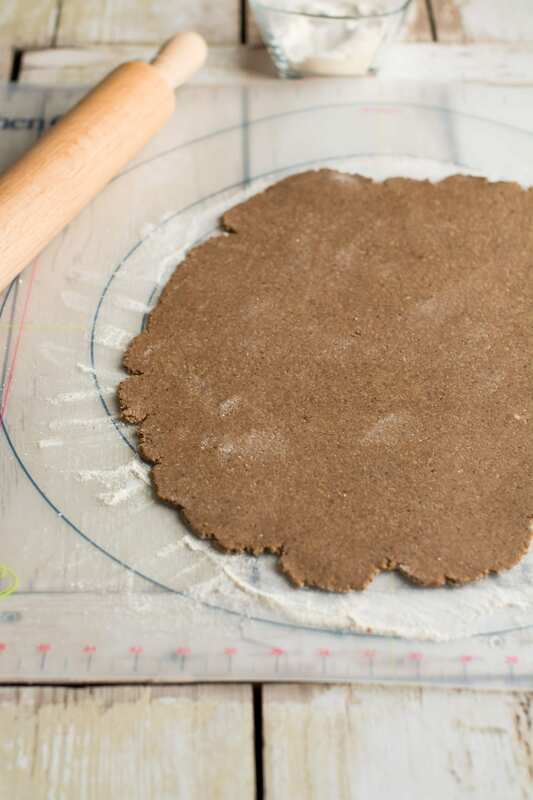 Divide the dough into 2-3 balls and place one at a time on a floured non-stick mat or on stone surface. Keep the dough you are not working with in fridge. Flour a rolling pin, sprinkle some flour on the dough and begin rolling it out until you have a rectangle or circle that is about 2mm thick. I like to press it down with my hands first to ease rolling. When rolling the dough ball try moving it around the surface every now and then to make sure there’s flour underneath and that it wouldn’t stick to the surface. Add flour if it starts to stick. 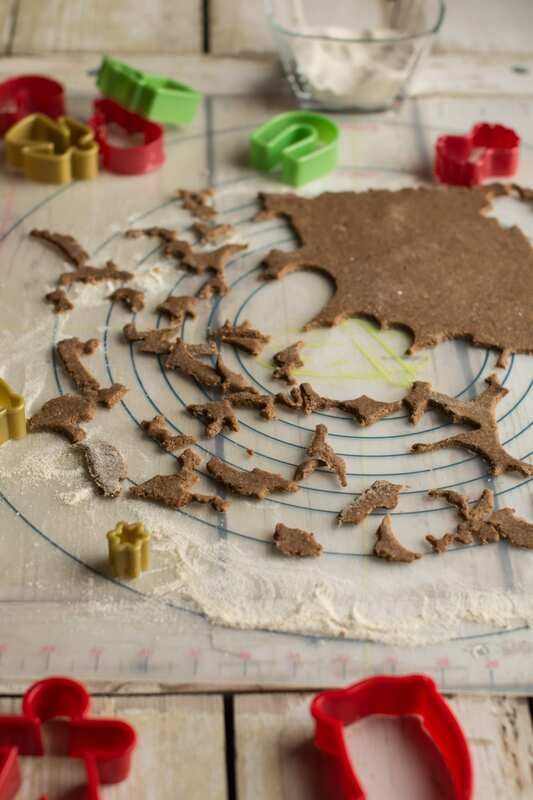 Cut the gingerbread into the shapes of your choice and place on a baking sheet lined with parchment paper. Bake for 10 minutes (175°C, 350°F), and then remove from oven. Rotate the pan and return to oven for 5-6 minutes longer, until golden. Carefully, transfer crackers to a cooling rack for 5-10 minutes. For egg-free royal icing grind 100 grams (3.5oz) of xylitol into powder (confectioner’s sugar). Whisk in 3 tbsps. of coconut milk and it’s ready. I divided the icing between three bowls and added some spirulina to one and some acai powder to the other to have different colours to play with. 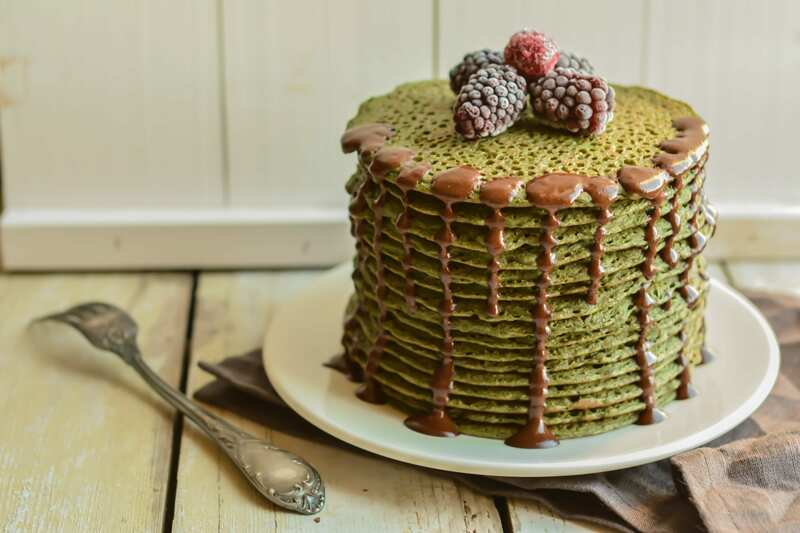 You can also use turmeric for yellow, matcha powder for green, beet juice for red/pink and blueberry juice or blended blueberries for blue/purple. I completely love hearing about the progression of your recipe. 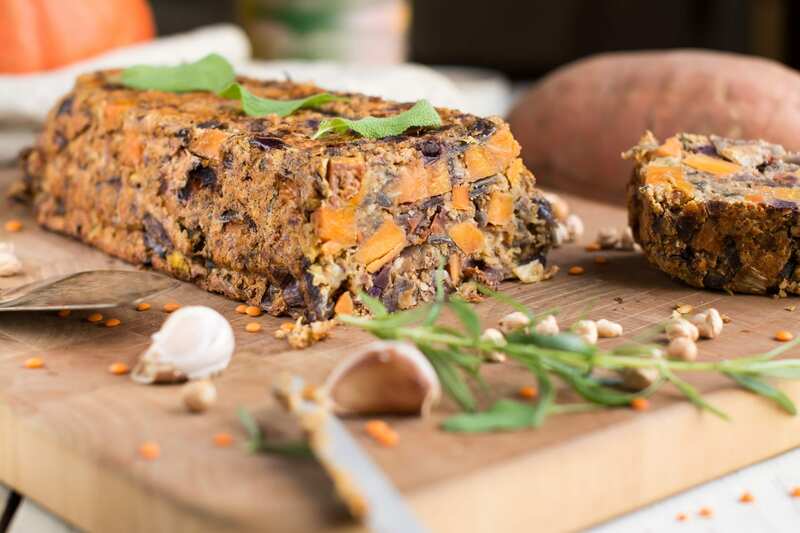 It resonates with how my cooking has changed and developed with each increasing commitment to “healthy” foods, and how my understanding of that word itself has morphed over time as my own knowledge and information base grew.